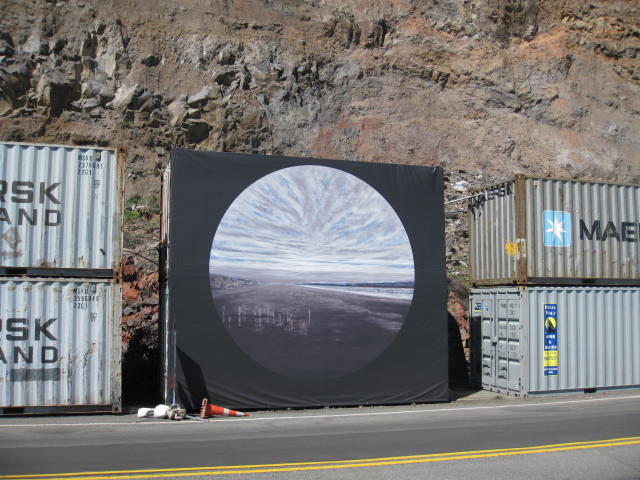 The next giant piece of art has been hung by the road to Sumner as part of the Container Art exhibition. By artist Tony Cribb, it’s a riot of colour and looks spectacular. To put in context: Sumner has long been loved by Christchurch residents and visitors alike – it has a seaside village feel that is quite delightful. One of the reasons it’s hung onto its village atmosphere is the fact that it’s removed from the city a little with just one road for access. The Canterbury quakes shook the cliffs up quite a bit and while extensive geo-tech work has been undertaken to remove any potentially dangerous rocks, as an additional precaution shipping containers have been placed below the cliffs beside the road as a safety buffer from any rebel rocks falling. Residents were a little glum about the new outlook and three locals, Bryan L’Estrange, Pam Guest and Dinesh Patel have put a new spin on the generally austere containers by stretching creative art canvases across the fronts. Calling for sponsors to help with costs (some of the containers are 12m long) as well as artists to supply images, the exhibition will evolve over time. Great idea – looks stunning – long may it continue. And in a similar vein of beautification, another local – Christine Reitze – is planning to completely cover one of the containers with what we used to call peggy squares, knitted 30cm x 30cm squares joined together to create a giant ‘container cozy’. Estimated to need some 860 squares Christine has about 100 so far and is gratefully accepting knitted donations. The finished article is sure to bring a smile to any face.